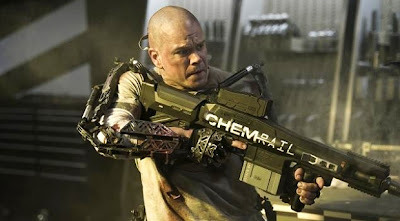 Final Cut Compendium: In a dystopian future (yes, again), ex-con Max (Matt Damon) longs to live with the 1% on Elysium, a space station Shangri-La orbiting a slum-strewn, crappy-aired 2154 Earth. Max's desire to travel there turns dire after a workplace mishap as dude goes guns a-blazin' to the star-shaped pie in the sky for treatment in one of Elysium's magical healing pods, all while the space station's secretary of defense (Jodie Foster) and her ruthless, militaristic mercenary (Sharlto Copley) aim to put Max down before he opens Elysium's doors to the remaining 99%. Director Neill Blomkamp's visuals: Elysium looks stunning: crisp, clean – seamless – CGI fused to Earth's WALL-E topography and Elysium's utopian environs. Same outrageously-organic feel as the South African's brilliant, 2009 best picture nominee District 9. Sharlto Copley: The star of District 9 steals the show as the maniacal Agent Kruger — Grizzly Adams beard's a nice touch. Jodie Foster: What form of British-ish accent is Foster attempting exactly? Whatever the heck it is, the two-time Academy Award winner was so brutally bad in her first attempt, Blomkamp clearly overdubbed it with Foster's second go-of-it throughout. A Razzie-worthy performance. Writer Neill Blomkamp: Blomkamp blends sci-fi and social commentary once again, revisiting the have-versus-have-nots – segregational – trope with success but why did I not give a rats about Damon's tatted-to-the-max character? His cyborg-suited, Iron Man-esque battle to the death with Copley has zero excitement to it. A massive disappointment given the sheer ingeniousness of Blomkamp's predecessor. Alternate title: District 4.5.